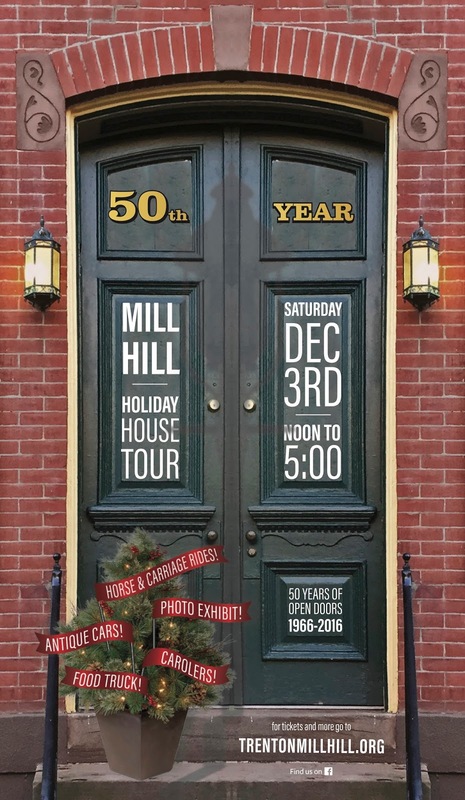 50th Anniversary Mill Hill Holiday House Tour - December 3, 2016 ~ The History Girl! It will be a fun, interesting and inspiring day for all ages and we hope you save the date and join us! The tour begins at ArtWorks, 19 Everett Alley, Trenton, NJ. For more information, call 609-638-3603 or visit www.trentonmillhill.org. 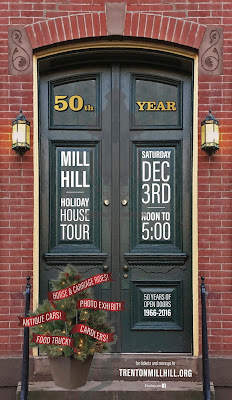 Since 1966, the Old Mill Hill Society has held an annual House Tour. Some numbers can put the 50 years of the House Tours into perspective. During that time, 149 houses and three churches in Mill Hill have been on the tour at one time or another. 112 Jackson, the only house on the first tour, has been on the tour 22 times under three different owners. 222 individuals and couples have opened their houses for the tour and an estimated 15,000 people have come on the tour. The history of the House Tour runs parallel with the transformation of the modern neighborhood of Mill Hill. The House Tours didn’t start to show off a fully rehabilitated neighborhood but rather to bring people to a neighborhood that was just beginning to transform. In the 1950’s the City of Trenton identified Mill Hill, then known as the Mercer-Jackson neighborhood, as a priority district for urban renewal. Remarkably, instead of deciding to tear down the blighted area, the City moved to rehabilitate the area following the model of Georgetown in Washington, DC. The City got a HUD grant in the early 1960’s to implement an urban renewal plan for Mercer-Jackson. On February 28, 1964, Arthur J. Holland, the Mayor of Trenton, moved his family to 138 Mercer Street in Mill Hill. This move became national and even international news. The headline on the front page of the New York Times read, “Mayor moves to bi-racial area.” Holland’s widow, Betty, remembers sitting in the house on that snowy night and watching a report about the move on the Huntley–Brinkley Report, the NBC national nightly TV news program. Mayor Holland believed that integrated neighborhoods were the only answer for Trenton’s survival. Another neighborhood pioneer was Robert Allen, a sociologist, who bought 112 Jackson in 1966. Allen and Betty Holland revived the old name of the neighborhood, Mill Hill, and were instrumental in forming the Old Mill Hill Society. In an effort to get more people to come and see the neighborhood, the first “House Tour” – a Christmas reception in Allen’s house on Jackson Street was held in 1966. In those early years of the tour, very few people came. As part of the urban renewal project, the City installed the brick sidewalks and the Wellsbach Boulevard Lamps that have become a symbol of the neighborhood to the 100 blocks of Mercer and Jackson. Gradually, more people moved to the neighborhood, taking advantage of HUD low-interest loans to renovate houses. The number of houses on tour continued to grow as did the number of people attending. The first year that houses on the 200 block of Jackson and Mercer were on the tour was 1983 and the first house on Clay Street to be on the tour was in 1986. In 1991, the Old Mill Hill Society started an annual Garden Tour in June, which celebrated its 25th anniversary this year. Starting in 2001 and revised in 2006, the Old Mill Hill Society decided to dedicate part of the revenue from the House and Garden Tours to be awarded as grants to residents of the neighborhood to make external repairs and improvements on their houses. The Society recognized that historically appropriate renovations often are more costly and their completion benefits the whole neighborhood. Since 2007, more than $35,000 has been awarded to Mill Hill residents and property owners for these projects.